RAILROADS SELL THEIR CAPACITY WHOLESALE TO NON-ASSET IMCs: They, in turn, re-sell that capacity and interface direct with the shippers for operational and reporting support. BNSF's strategy is to not own boxes. UP, NS, and CSX own the majority of intermodal boxes riding on their rails. By using both asset and non-asset IMCs shippers can bring diversification to their logistics departments. When it comes to domestic intermodal, asset vs. non-asset is defined more in the eye of the beholder’s box ownership strategy. 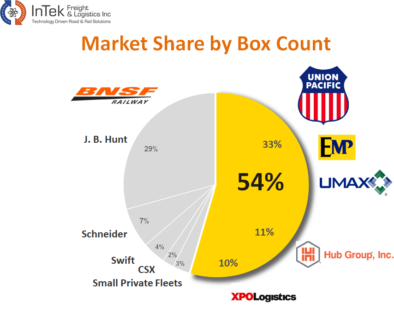 The BNSF’s strategy is to not own boxes, which drives shippers to asset IMCs like JB Hunt, Schneider, Swift and private box owners for intermodal capacity within its network. The Union Pacific, Norfolk South and CSX own the majority of 53-foot boxes riding on their rails. These railroads sell their capacity wholesale to non-asset IMCs that, in turn, re-sell that capacity and interface direct with the shippers for operational and reporting support. This is not to say one strategy is better than the other. It is just saying there are two different strategies. The different strategies do open up the opportunity to confuse some shippers into thinking the non-asset IMCs do not have the box assets required to operate their business, when in reality they have the full backing and support of UP / NS /CSX and by not including the non-asset IMCs is essentially cutting off 50 percent of the market capacity, while also missing out on some key ramps that could be helpful in their freight lanes. To illustrate the point, the below chart outlines market share by 53′ intermodal box count. The benefit the non-asset IMCs, like an InTek Freight & Logistics and other non-asset IMCs, have is they tap into almost 100 percent of the box market because they access the asset IMCs for the BNSF capacity and hold a direct relationship with the railroads for the UP / NS / CSX capacity. 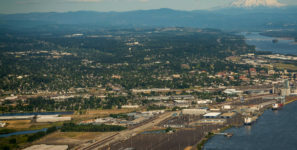 The point point is that the largest of shippers down to the smallest can draw upon 100 percent of the 53-foot domestic intermodal capacity for their customers’ benefit. In addition, by utilizing both asset and non-asset IMCs bring a diversification strategy into a shipper’s logistics department by providing shippers access to all intermodal ramp cities, as not all railroads have similar ramp networks. A couple of examples would be the Union Pacific has a Salt Lake City ramp and BNSF does not, while the BNSF has a Phoenix ramp and the Union Pacific does not. This is just a couple of examples, but can make a big difference in dray miles making a route either competitive or non-competitive. Diversifying risk off of a particular rail line during those times of maintenance, derailment, act of god issue, etc. that another rail line does not during the same time. As a shipper’s strategy goes, in many cases it probably makes sense for the largest of shippers to have a direct relationship with an asset IMC, such as JBH, while also holding a relationship with a non-asset IMC. For small to medium shippers, it might work to utilize a non-asset IMC that taps into both the asset network running on the BNSF, while leveraging its direct relationships with UP/NS/CSX.